Tenders have now closed for the sale of The Precinct Red Hill and a formal tender assessment process is underway. An outcome to this process is expected in the coming months and further information will be made available. 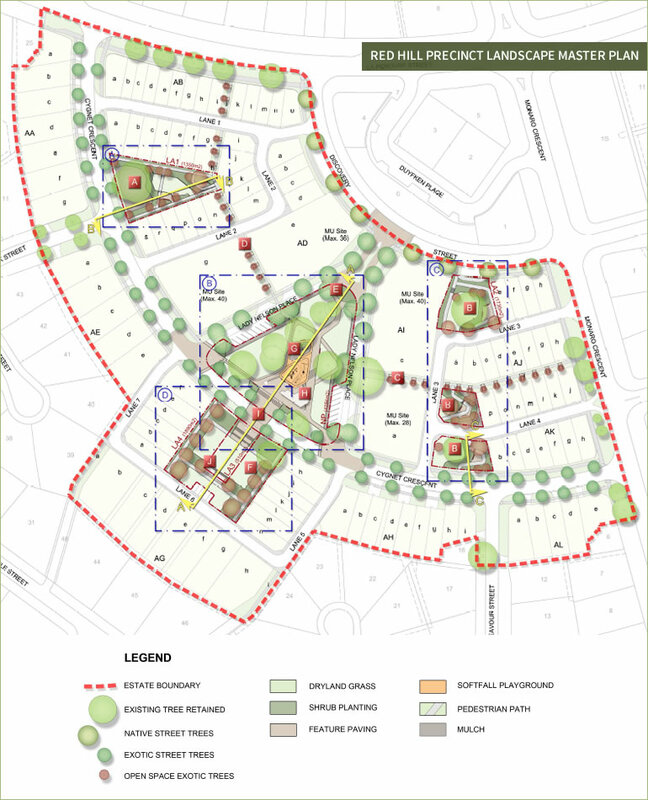 The Red Hill Public Housing Precinct is positioned adjacent to the Red Hill shops and is bound by La Perouse Street, Discovery Street, and Monaro Crescent. At 53,002m2, this generous site is nestled between the existing community of Red Hill who were also instrumental during the development of the vision for the site. The street names for the Precinct Red Hill were formally announced in October 2017, continuing the street name theme of Ships and Explorers in the wider Red Hill suburb. Demolition of the existing buildings has commenced and is being undertaken by Brema Group, the appointed site contractor. The works include the removal of hazardous material which is being undertaken by approved asbestos assessors and asbestos removal contractors. A minimum of 85% of materials from the demolition will be recycled including steel, concrete and bricks. Working hours have been extended during daylight savings are from Monday to Friday between 7am-6:30pm, to ensure demolition work remains on schedule. From 5.30pm to 6.30pm there will be no truck movements outside of the demolition site and no hammer work will be undertaken. Demolition is expected to be complete by March 2018. A temporary Traffic Management Plan will continue during the demolition works to facilitate safe and smooth operations. Trucks exit the site onto Monaro Crescent or La Perouse Street to access Hindmarsh Drive. To mitigate the impact during weekday peak hours, truck movement will not occur between 8-9am and 3-4pm. Cygnet Crescent from La Perouse Street to Endeavour Street will remain closed for the duration of the demolition and detour signage will be in place. Pedestrian access from Beagle Street through to the Red Hill shops will be maintained during demolition. 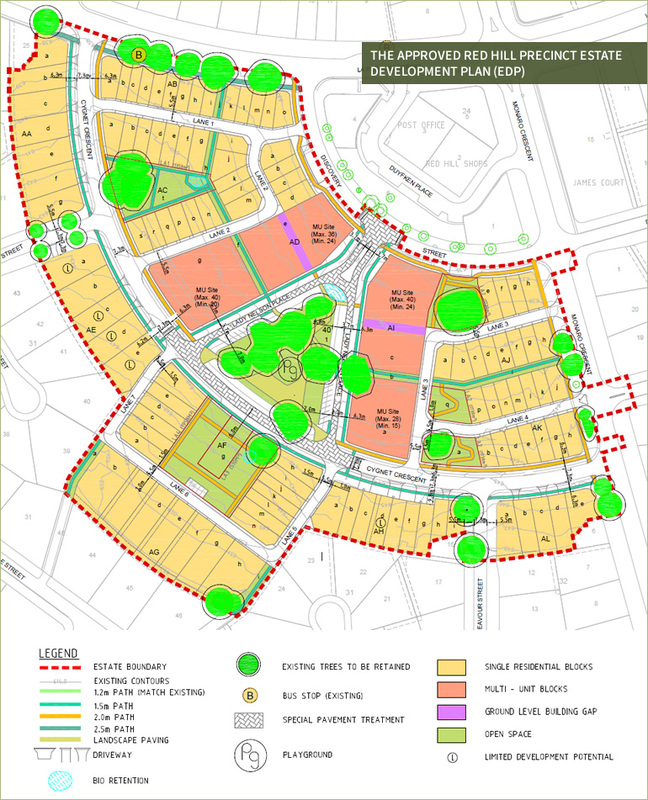 The ACT Government worked closely with the local Red Hill community to define the vision and deliverables within the Estate Development Plan (EDP). The EDP was approved earlier this year and will be mandatory for development by the purchaser. The EDP includes a combination of single residential, terrace style and Multi Unit dwellings and a vast open space network. The combination of allowable deliverables within the EDP will influence connectivity, continuity and fantastic views by leveraging the topography of the land. Open space is a key focal point within the EDP with five designated parks and numerous green spines distributed widely throughout the precinct. These spaces aim to reflect the natural character of the wider suburb with pedestrian linkages used to connect people in and around the suburb. Lady Nelson Park will be a central focus of the development and will provide the surrounding community with a high quality destination at the heart of the precinct.